I love traditions, and I love celebrating. A loved tradition that my husband and I have been able to bring along and make our own is our Christmas Tree. As we continue to purge and downsize our physical belongings and the entourage of stuff we possess, our tradition of a little tree has been able to stay with us. While it was originally a necessity because of the size of our apartment (and budget) it has become a matter of pride. Our little (rarely over 4ft tall) tree sites on a side table and fills the room with as much delight as a tree twice the size or twice the price. Collecting ornamental treasures has been a delight of mine since I was very little but never quite had the "what to put on top" question quite worked out. Growing up we often put humorous or something that happened to be at hand - such as a hedgehog dog chew toy, or a duck puppet - but I wanted something that could be illuminated and celebrate the lighting of the darkness, just as the tree itself. I made a simple paper star and could not be more thrilled with the results! I can't find the tutorial I used but it's the same as this one. Since the end of our farmshare we have been gathering vegetables from farmer's markets, my step-father, and our own stores and gardens. From the Coventry winter Farmer's Market we got some rutabagas a couple of weeks ago as I'd wanted to make a better Upper Peninsula (of Michigan) pasty. I made some improved ones a few weeks ago and while they were fantastically delicious, I knew I could do better. 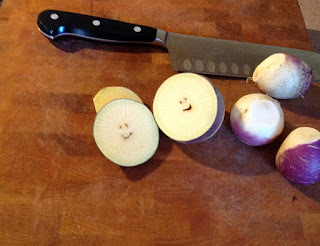 Happy rutabagas are tasty rutabagas.